What is the Karma of a caterpillar? Many people believe in the Law of Karma, of Cause and Effect and how what we do can come back on us, but do animals have karma too? Many people believe in the so-called Law of Karma, which deals in cause and effect and that what is done at one time will have a reaction at another that will either reward or punish the perpetrator. In some religious systems such as Jainism it is thought that every living organism has its own karma and it is wrong (“bad karma”) to interfere in any other being’s individual karma. Bearing these thoughts in mind, I am wondering, what is the karma of all the caterpillars that die of starvation, simply because there were insufficient leaves on the food-plants that were available? And what is the karma of humans, who make no effort to aid these insects’ survival, yet hypocritically say they love to see “pretty butterflies”? It is the same problem as all the humans who die each day of starvation and thirst. Who is to say who lives and who dies? What is the karma, if it exists, of those that do, and what is the karma of those of us who allow this to go on? Let me explain what I mean. What is the value of a caterpillar in the bigger picture? 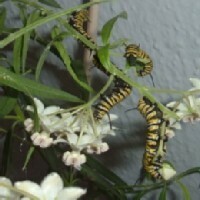 The Monarch Butterfly (Danaus plexippus) has a serious problem where I live in Tenerife. Its caterpillars can only eat Scarlet Milkweed (Asclepias currasavica), which is grown in some parks and gardens (not enough! ), or Swan Plant (Gomphocarpus fruticosus), a recent introduction but not found growing in the wild just like the other food-plant of the Monarch. The female butterflies have hundreds of eggs to lay and are compelled to seek out the correct plants on which to deposit them. This they have to do. It is their role in life! The Milkweed and Swan Plant are not grown in many gardens and there are no wild species the butterfly can use. This means that although in a natural habitat there should be enough food for each caterpillar, and each female should lay only one or two eggs per plant, they do not have this opportunity with a severe scarcity of food-plants. If a mother Monarch finds a plant she will return over and over again to place her eggs on it. Without human intervention a disaster will occur because when the baby caterpillars hatch there will ultimately not be anywhere like enough food to support them all and after all the leaves are gone they will all die. I have tried to help the situation but it is so very difficult. When a female Monarch turns up and lays her eggs on the small number of plants I have on my balcony I know there are far too many. I am forced to turn her away by catching her and moving her. I am forced to play God and instigate some sort of cull by crushing many of the eggs. I hate doing this so much! I am forced to become a murderer to try and save some lives! When the babies hatch it is even harder. Each one could be a beautiful Monarch butterfly that would one day soar through the skies but it is obvious that most will never reach that stage. Most will die horribly of starvation! Each caterpillar knows it is in a race against time and that it must cram as much food into its mouth as fast as it can. It is `programmed into its DNA. As they grow they start to eat stems, seed-pods, shrivelled leaves, flower-buds, and any part of the plant they can find. They are not concerned with the quality of the plant material as long as it is of the species they must eat. They eat leaves all covered in sooty mould from aphids, they will eat the fluffy-haired seeds even, just as long as it is Milkweed or Swan Plant! You can see and feel their desperation, or at least I can! When a plant is stripped of leaves and flowers they start to wander frantically. Each individual caterpillar knows it must consume the correct amount of plant material or it will die. If you are a human who has become involved in this it becomes a very emotional relationship. At its most extreme, each caterpillar is a child! Sadly humans I tell about this problem and give seeds to so they can grow the food-plants mostly do not bother for whatever reason. I cannot make them help out! The small numbers that do make an effort are often faced with the same problem of how to feed too many hungry caterpillars. This is no easy job I admit! At the same time it pains me to watch caterpillars starve! I know this isn't just the Monarch Butterfly but all butterflies the same principle applies to. We could have so many more butterflies in the world if enough humans cared. Of that I am 100% sure! I was never too certain about, or didn’t want to accept the grim reality, of the idea of the ‘survival of the fittest’ as proposed by Charles Darwin but in my studies of the Monarch Butterfly I have witnessed this in action. Only the biggest, greediest and strongest caterpillars that manage to stuff as much Milkweed or Swan Plant down them as fast as they can have any chance of pupating. At the same time each smaller and weaker specimen could become a perfect adult insect if only it was given the chance. Who grants it that chance? Why is one caterpillar any better than any other? What value is a caterpillar’s life and what is its karma?